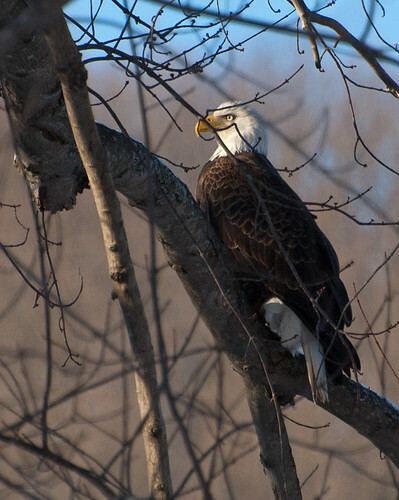 January 15th was the annual waterfowl and eagle count for the Buffalo Ornithological Society. Tim, Bert and I covered a section of Cattaraugus County in Western New York. Despite the warmer than average winter, that day started off at -10 degrees but we forged on, adding further evidence to my husband’s theory that birders are an odd lot. Waterfowl counts were down significantly from prior years. The prevailing thought was that a lot of water to the north (like Lake Erie) was not yet frozen over, so the birds had not yet moved down our way to open water along the Allegheny River. We saw only five species of waterfowl, two bald eagles, and a total of just over 20 species on the day. It was still a fun day and Tim and Bert are excellent birders to spend time with. Full species list follows. This entry was posted on 26 January 2012 by patacoate. It was filed under iPhone . Well, if there were that few species I’d be good enough to participate in a bird count! Thats a wonderful picture of a Bald Eagle. Stay warm!